Proprietary Name: Augmentin What is the Proprietary Name? Non-Proprietary Name: Amoxicillin And Clavulanate Potassium What is the Non-Proprietary Name? Augmentin with NDC 72508-018 is a a human prescription drug product labeled by Neopharma Inc. The generic name of Augmentin is amoxicillin and clavulanate potassium. The product's dosage form is tablet, film coated and is administered via oral form. FDA Application Number: NDA050564 What is the FDA Application Number? When susceptibility test results show susceptibility to amoxicillin, indicating no beta-lactamase production, AUGMENTIN should not be used. 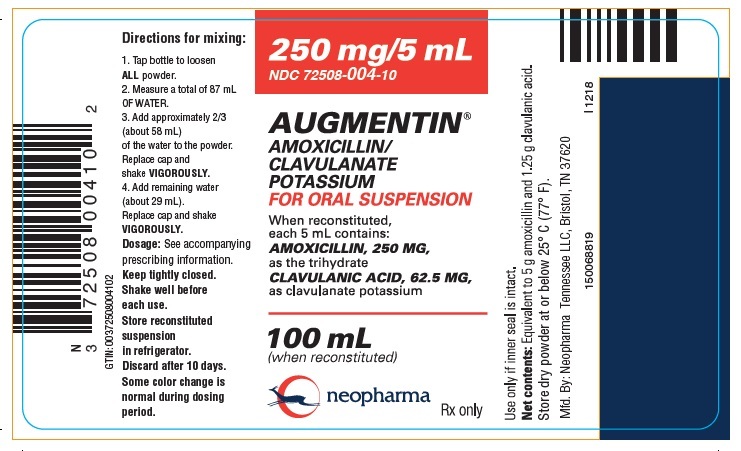 AUGMENTIN may be taken without regard to meals; however, absorption of clavulanate potassium is enhanced when AUGMENTIN is administered at the start of a meal. To minimize the potential for gastrointestinal intolerance, AUGMENTIN should be taken at the start of a meal. The usual adult dose is one 500 mg tablet of AUGMENTIN every 12 hours or one 250 mg tablet of AUGMENTIN every 8 hours. For more severe infections and infections of the respiratory tract, the dose should be one 875 mg tablet of AUGMENTIN every 12 hours or one 500 mg tablet of AUGMENTIN every 8 hours. Adults who have difficulty swallowing may be given the 125 mg/5 mL or 250 mg/5 mL suspension in place of the 500 mg tablet. The 200 mg/5 mL suspension or the 400 mg/5 mL suspension may be used in place of the 875 mg tablet. Two 250 mg tablets of AUGMENTIN should not be substituted for one 500 mg tablet of AUGMENTIN. Since both the 250 mg and 500 mg tablets of AUGMENTIN contain the same amount of clavulanic acid (125 mg, as the potassium salt), two 250 mg tablets are not equivalent to one 500 mg tablet of AUGMENTIN. The 250 mg tablet of AUGMENTIN and the 250 mg chewable tablet should not be substituted for each other, as they are not interchangeable. The 250 mg tablet of AUGMENTIN and the 250 mg chewable tablet do not contain the same amount of clavulanic acid (as the potassium salt). The 250 mg tablet of AUGMENTIN contains 125 mg of clavulanic acid, whereas the 250 mg chewable tablet contains 62.5 mg of clavulanic acid. 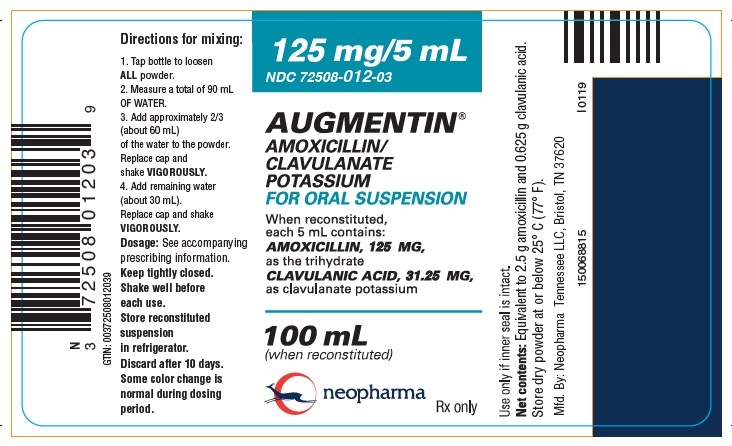 Based on the amoxicillin component, AUGMENTIN should be dosed as follows:Neonates and Infants Aged <12 weeks (<3 months): The recommended dose of AUGMENTIN is 30 mg/kg/day divided every 12 hours, based on the amoxicillin component. Experience with the 200 mg/5 mL formulation in this age group is limited, and thus, use of the 125 mg/5 mL oral suspension is recommended. Patients Aged 12 weeks (3 months) and Older: See dosing regimens provided in Table 1. The every 12 hour regimen is recommended as it is associated with significantly less diarrhea [see Clinical Studies (14.2)]. However, the every 12 hour suspension (200 mg/5 mL and 400 mg/5 mL) and chewable tablets (200 mg and 400 mg) contain aspartame and should not be used by phenylketonurics. [see Warnings and Precautions (5.6)] Table 1: Dosing in Patients Aged 12 weeks (3 months) and Older INFECTION DOSING REGIMEN Every 12 hours Every 8 hours 200 mg/5 mL or 400 mg/5 mL oral suspensiona125 mg/5 mL or 250 mg/5 mL oral suspensionaOtitis mediab, sinusitis, lower respiratory tract infections, and more severe infections 45 mg/kg/day every 12 hours40 mg/kg/day every 8 hoursLess severe infections25 mg/kg/day every 12 hours20 mg/kg/day every 8 hoursa Each strength of suspension of AUGMENTIN is available as a chewable tablet for use by older children. b Duration of therapy studied and recommended for acute otitis media is 10 days. Patients Weighing 40 kg or More: Pediatric patients weighing 40 kg or more should be dosed according to adult recommendations. 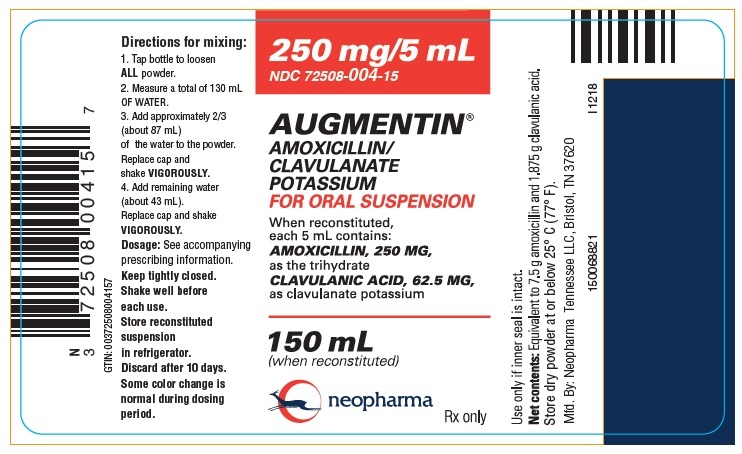 The 250 mg tablet of AUGMENTIN should not be used until the child weighs at least 40 kg, due to the different amoxicillin to clavulanic acid ratios in the 250 mg tablet of AUGMENTIN (250/125) versus the 250 mg chewable tablet of AUGMENTIN (250/62.5). Patients with impaired renal function do not generally require a reduction in dose unless the impairment is severe. Renal impairment patients with a glomerular filtration rate of <30 mL/min should not receive the 875 mg dose. Patients with a glomerular filtration rate of 10 to 30 mL/min should receive 500 mg or 250 mg every 12 hours, depending on the severity of the infection. Patients with a glomerular filtration rate less than 10 mL/min should receive 500 mg or 250 mg every 24 hours, depending on severity of the infection. Hemodialysis patients should receive 500 mg or 250 mg every 24 hours, depending on severity of the infection. They should receive an additional dose both during and at the end of dialysis. Prepare a suspension at time of dispensing as follows: Tap bottle to loosen ALL powder. Measure a total (see Table 2 below for total amount of water for reconstitution) OF WATER. Add approximately 2/3 of the water to the powder. Replace cap and shake VIGOROUSLY. Add remaining water. Replace cap and shake VIGOROUSLY. Note: Shake oral suspension well before using. Reconstituted suspension must be stored under refrigeration and discarded after 10 days. Some color change is normal during dosing period. Tablets: · 250 mg/125 mg Tablets: Each white oval film-coated tablet, debossed with AUGMENTIN on one side and 250/125 on the other side, contains 250 mg of amoxicillin and 125 mg clavulanic acid as the potassium salt. · 500 mg/125 mg Tablets: Each white oval film-coated tablet, debossed with AUGMENTIN on one side and 500/125 on the other side, contains 500 mg amoxicillin and 125 mg of clavulanic acid as the potassium salt. · 875 mg/125 mg Tablets: Each scored white capsule‑shaped tablet, debossed with AUGMENTIN 875 on one side and scored on the other side, contains 875 mg amoxicillin and 125 mg clavulanic acid as the potassium salt. Powder for Oral Suspension: · 125 mg/31.25 mg per 5 mL: Banana-flavored powder for oral suspension (each 5 mL of reconstituted suspension contains 125 mg amoxicillin and 31.25 mg of clavulanic acid as the potassium salt). · 200 mg/28.5 mg per 5 mL: Orange-flavored powder for oral suspension (each 5 mL of reconstituted suspension contains 200 mg amoxicillin and 28.5 mg of clavulanic acid as the potassium salt). · 250 mg/62.5 mg per 5 mL: Orange-flavored powder for oral suspension (each 5 mL of reconstituted suspension contains 250 mg amoxicillin and 62.5 mg of clavulanic acid as the potassium salt). · 400 mg/57 mg per 5 mL Orange-flavored powder for oral suspension (each 5 mL of reconstituted suspension contains 400 mg amoxicillin and 57.0 mg of clavulanic acid as the potassium salt). Chewable Tablets: · 125 mg/31.25 mg Chewable Tablets: Each mottled yellow, round, lemon-lime-flavored tablet, debossed with BMP 189 contains 125 mg amoxicillin and 31.25 mg clavulanic acid as the potassium salt. · 200 mg/28.5 mg Chewable Tablets: Each mottled pink, round, biconvex cherry-banana-flavored tablet, debossed with AUGMENTIN 200 contains 200 mg amoxicillin and 28.5 mg clavulanic acid as the potassium salt. · 250 mg/62.5 mg Chewable Tablets: Each mottled yellow, round, lemon-lime-flavored tablet, debossed with BMP 190 contains 250 mg amoxicillin and 62.5 mg clavulanic acid as the potassium salt. · 400 mg/57 mg Chewable Tablets: Each mottled pink, round, biconvex cherry-banana-flavored tablet, debossed with AUGMENTIN 400 contains 400 mg amoxicillin and 57.0 mg clavulanic acid as the potassium salt. The 250 mg tablet of AUGMENTIN and the 250 mg chewable tablet should NOT be substituted for each other, as they are not interchangeable and the 250 mg tablet should not be used in children weighing less than 40 kg. The 250 mg tablet of AUGMENTIN and the 250 mg chewable tablet do not contain the same amount of clavulanic acid. The 250 mg tablet of AUGMENTIN contains 125 mg of clavulanic acid whereas the 250 mg chewable tablet contains 62.5 mg of clavulanic acid. Two 250 mg tablets of AUGMENTIN should NOT be substituted for one 500 mg tablet of AUGMENTIN. Since both the 250 mg and 500 mg tablets of AUGMENTIN contain the same amount of clavulanic acid (125 mg, as the potassium salt), two 250 mg tablets of AUGMENTIN are not equivalent to one 500 mg tablet of AUGMENTIN. 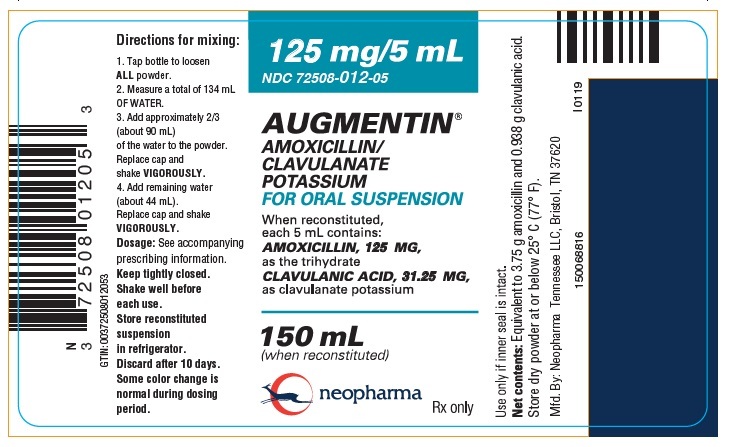 AUGMENTIN is contraindicated in patients with a history of serious hypersensitivity reactions (e.g., anaphylaxis or Stevens-Johnson syndrome) to amoxicillin, clavulanate or to other beta‑lactam antibacterial drugs (e.g., penicillins and cephalosporins). AUGMENTIN is contraindicated in patients with a previous history of cholestatic jaundice/hepatic dysfunction associated with AUGMENTIN. Serious and occasionally fatal hypersensitivity (anaphylactic) reactions have been reported in patients receiving beta-lactam antibacterials, including AUGMENTIN. These reactions are more likely to occur in individuals with a history of penicillin hypersensitivity and/or a history of sensitivity to multiple allergens. Before initiating therapy with AUGMENTIN, careful inquiry should be made regarding previous hypersensitivity reactions to penicillins, cephalosporins, or other allergens. If an allergic reaction occurs, AUGMENTIN should be discontinued and appropriate therapy instituted. Hepatic dysfunction, including hepatitis and cholestatic jaundice has been associated with the use of AUGMENTIN. Hepatic toxicity is usually reversible; however, deaths have been reported. Hepatic function should be monitored at regular intervals in patients with hepatic impairment. Clostridium difficile associated diarrhea (CDAD) has been reported with use of nearly all antibacterial agents, including AUGMENTIN, and may range in severity from mild diarrhea to fatal colitis. Treatment with antibacterial agents alters the normal flora of the colon leading to overgrowth of C. difficile. C. difficile produces toxins A and B which contribute to the development of CDAD. Hypertoxin-producing strains of C. difficile cause increased morbidity and mortality, as these infections can be refractory to antimicrobial therapy and may require colectomy. CDAD must be considered in all patients who present with diarrhea following antibacterial use. Careful medical history is necessary since CDAD has been reported to occur over 2 months after the administration of antibacterial agents. If CDAD is suspected or confirmed, ongoing antibacterial use not directed against C. difficile may need to be discontinued. Appropriate fluid and electrolyte management, protein supplementation, antibacterial treatment of C. difficile, and surgical evaluation should be instituted as clinically indicated. A high percentage of patients with mononucleosis who receive amoxicillin develop an erythematous skin rash. Thus, AUGMENTIN should not be administered to patients with mononucleosis. AUGMENTIN Chewable tablets and AUGMENTIN Powder for Oral Solution contain aspartame which contains phenylalanine. Each 200 mg chewable tablet of AUGMENTIN contains 2.1 mg phenylalanine; each 400 mg chewable tablet contains 4.2 mg phenylalanine; each 5 mL of either the 200 mg/5 mL or 400 mg/5 mL oral suspension contains 7 mg phenylalanine. The other formulations of AUGMENTIN do not contain phenylalanine. Prescribing AUGMENTIN in the absence of a proven or strongly suspected bacterial infection is unlikely to provide benefit to the patient, and increases the risk of the development of drug‑resistant bacteria. In addition to adverse reactions reported from clinical trials, the following have been identified during postmarketing use of AUGMENTIN. Because they are reported voluntarily from a population of unknown size, estimates of frequency cannot be made. These events have been chosen for inclusion due to a combination of their seriousness, frequency of reporting, or potential causal connection to AUGMENTIN. Gastrointestinal: Indigestion, gastritis, stomatitis, glossitis, black “hairy” tongue, mucocutaneous candidiasis, enterocolitis, and hemorrhagic/pseudomembranous colitis. Onset of pseudomembranous colitis symptoms may occur during or after antibiotic treatment. [see Warnings and Precautions (5.3) ]Hypersensitivity Reactions: Pruritus, angioedema, serum sickness–like reactions (urticaria or skin rash accompanied by arthritis, arthralgia, myalgia, and frequently fever), erythema multiforme, Stevens‑Johnson syndrome, acute generalized exanthematouspustulosis, hypersensitivity vasculitis, and cases of exfoliative dermatitis (including toxic epidermal necrolysis) have been reported. [see Warnings and Precautions (5.1) ] Liver: Hepatic dysfunction, including hepatitis and cholestatic jaundice, increases in serum transaminases (AST and/or ALT), serum bilirubin, and/or alkaline phosphatase, has been reported with AUGMENTIN. It has been reported more commonly in the elderly, in males, or in patients on prolonged treatment. The histologic findings on liver biopsy have consisted of predominantly cholestatic, hepatocellular, or mixed cholestatic hepatocellular changes. The onset of signs/symptoms of hepatic dysfunction may occur during or several weeks after therapy has been discontinued. The hepatic dysfunction, which may be severe, is usually reversible. Deaths have been reported. [see Contraindications (4.2), Warnings and Precautions (5.2) ] Renal: Interstitial nephritis, hematuria, and crystalluria have been reported. [see Overdosage (10) ]Hemic and Lymphatic Systems: Anemia, including hemolytic anemia, thrombocytopenia, thrombocytopenic purpura, eosinophilia, leukopenia, and agranulocytosis have been reported. These reactions are usually reversible on discontinuation of therapy and are believed to be hypersensitivity phenomena. Thrombocytosis was noted in less than 1% of the patients treated with AUGMENTIN. There have been reports of increased prothrombin time in patients receiving AUGMENTIN and anticoagulant therapy concomitantly. [see Drug Interactions (7.2) ] Central Nervous System: Agitation, anxiety, behavioral changes, confusion, convulsions, dizziness, insomnia, and reversible hyperactivity have been reported. Miscellaneous: Tooth discoloration (brown, yellow, or gray staining) has been reported. Most reports occurred in pediatric patients. Discoloration was reduced or eliminated with brushing or dental cleaning in most cases. Probenecid decreases the renal tubular secretion of amoxicillin but does not delay renal excretion of clavulanic acid. Concurrent use with AUGMENTIN may result in increased and prolonged blood concentrations of amoxicillin. Coadministration of probenecid is not recommended. Abnormal prolongation of prothrombin time (increased international normalized ratio [INR]) has been reported in patients receiving amoxicillin and oral anticoagulants. Appropriate monitoring should be undertaken when anticoagulants are prescribed concurrently with AUGMENTIN. Adjustments in the dose of oral anticoagulants may be necessary to maintain the desired level of anticoagulation. AUGMENTIN may affect intestinal flora, leading to lower estrogen reabsorption and reduced efficacy of combined oral estrogen/progesterone contraceptives. High urine concentrations of amoxicillin may result in false-positive reactions when testing for the presence of glucose in urine using CLINITEST®, Benedict’s Solution, or Fehling’s Solution. Since this effect may also occur with AUGMENTIN, it is recommended that glucose tests based on enzymatic glucose oxidase reactions be used. Following administration of amoxicillin to pregnant women, a transient decrease in plasma concentration of total conjugated estriol, estriol-glucuronide, conjugated estrone, and estradiol has been noted. Teratogenic Effects: Pregnancy Category B. Reproduction studies performed in pregnant rats and mice given AUGMENTIN (2:1 ratio formulation of amoxicillin:clavulanate) at oral doses up to 1200 mg/kg/day revealed no evidence of harm to the fetus due to AUGMENTIN. The amoxicillin doses in rats and mice (based on body surface area) were approximately 4 and 2 times the maximum recommended adult human oral dose (875 mg every 12 hours). For clavulanate, these dose multiples were approximately 9 and 4 times the maximum recommended adult human oral dose (125 mg every 8 hours). There are, however, no adequate and well-controlled studies in pregnant women. Because animal reproduction studies are not always predictive of human response, this drug should be used during pregnancy only if clearly needed. Of the 3,119 patients in an analysis of clinical studies of AUGMENTIN, 32% were ≥65 years old, and 14% were ≥75 years old. No overall differences in safety or effectiveness were observed between these subjects and younger subjects, and other reported clinical experience has not identified differences in responses between the elderly and younger patients, but greater sensitivity of some older individuals cannot be ruled out. This drug is known to be substantially excreted by the kidney, and the risk of adverse reactions to this drug may be greater in patients with impaired renal function. Because elderly patients are more likely to have decreased renal function, care should be taken in dose selection, and it may be useful to monitor renal function. 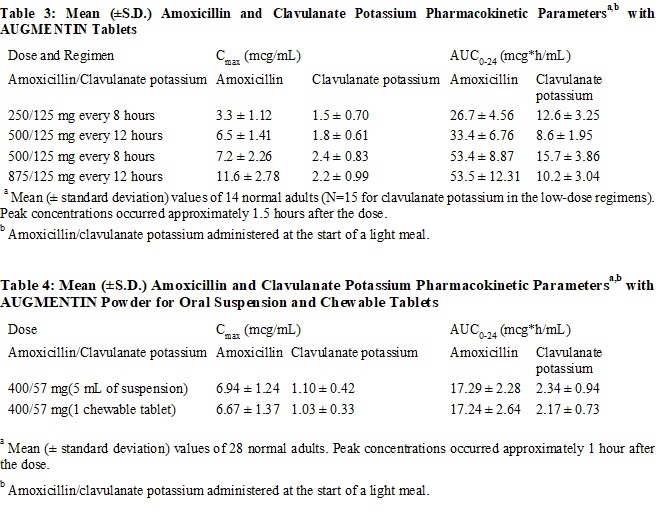 Mean amoxicillin and clavulanate potassium pharmacokinetic parameters in normal adults following administration of AUGMENTIN Tablets are shown in Table 3 and following administration of AUGMENTIN Powder for Oral Suspension and Chewable Tablets are shown in Table 4. Oral administration of 5 mL of 250 mg/5 mL suspension of AUGMENTIN or the equivalent dose of 10 mL of 125 mg/5 mL suspension of AUGMENTIN provides average peak serum concentrations approximately 1 hour after dosing of 6.9 mcg/mL for amoxicillin and 1.6 mcg/mL for clavulanic acid. The areas under the serum concentration curves obtained during the first 4 hours after dosing were 12.6 mcg*h/mL for amoxicillin and 2.9 mcg*h/mL for clavulanic acid when 5 mL of 250 mg/5 mL suspension of AUGMENTIN or equivalent dose of 10 mL of 125 mg/5 mL suspension of AUGMENTIN were administered to normal adults. One 250 mg chewable tablet of AUGMENTIN or two 125 mg chewable tablets of AUGMENTIN are equivalent to 5 mL of 250 mg/5 mL suspension of AUGMENTIN and provide similar serum concentrations of amoxicillin and clavulanic acid.Amoxicillin serum concentrations achieved with AUGMENTIN are similar to those produced by the oral administration of equivalent doses of amoxicillin alone. Time above the minimum inhibitory concentration of 1 mcg/mL for amoxicillin has been shown to be similar after corresponding every 12 hour and every 8 hour dosing regimens of AUGMENTIN in adults and children. Absorption: Dosing in the fasted or fed state has minimal effect on the pharmacokinetics of amoxicillin. While AUGMENTIN can be given without regard to meals, absorption of clavulanate potassium when taken with food is greater relative to the fasted state. In one study, the relative bioavailability of clavulanate was reduced when AUGMENTIN was dosed at 30 and 150 minutes after the start of a high‑fat breakfast. Distribution: Neither component in AUGMENTIN is highly protein‑bound; clavulanic acid is approximately 25% bound to human serum and amoxicillin approximately 18% bound. Amoxicillin diffuses readily into most body tissues and fluids with the exception of the brain and spinal fluid. Two hours after oral administration of a single 35 mg/kg dose of suspension of AUGMENTIN to fasting children, average concentrations of 3 mcg/mL of amoxicillin and 0.5 mcg/mL of clavulanic acid were detected in middle ear effusions. Metabolism and Excretion: The half‑life of amoxicillin after the oral administration of AUGMENTIN is 1.3 hours and that of clavulanic acid is 1 hour. Approximately 50% to 70% of the amoxicillin and approximately 25% to 40% of the clavulanic acid are excreted unchanged in urine during the first 6 hours after administration of a single 250 mg or 500 mg tablet of AUGMENTIN. Amoxicillin is a semisynthetic antibiotic with in vitro bactericidal activity against Gram-positive and Gram-negative bacteria. Amoxicillin is, however, susceptible to degradation by beta-lactamases, and therefore, the spectrum of activity does not include organisms which produce these enzymes. Clavulanic acid is a beta-lactam, structurally related to the penicillins, which possesses the ability to inactivate some beta-lactamase enzymes commonly found in microorganisms resistant to penicillins and cephalosporins. In particular, it has good activity against the clinically important plasmid-mediated beta-lactamases frequently responsible for transferred drug resistance. The formulation of amoxicillin and clavulanic acid in AUGMENTIN protects amoxicillin from degradation by some beta-lactamase enzymes and extends the antibiotic spectrum of amoxicillin to include many bacteria normally resistant to amoxicillin. Amoxicillin/clavulanic acid has been shown to be active against most isolates of the following bacteria, both in vitro and in clinical infections as described in the INDICATIONS AND USAGE section. Gram-positive bacteria Staphylococcus aureus Gram-negative bacteria Enterobacter species Escherichia coli Haemophilus influenzae Klebsiella species Moraxella catarrhalis The following in vitro data are available, but their clinical significance is unknown. At least 90 percent of the following bacteria exhibit an in vitro minimum inhibitory concentration (MIC) less than or equal to the susceptible breakpoint for amoxicillin/clavulanic acid. However, the efficacy of amoxicillin/clavulanic acid in treating clinical infections due to these bacteria has not been established in adequate and well-controlled clinical trials. Gram-positive bacteria Enterococcus faecalis Staphylococcus epidermidis Staphylococcus saprophyticus Streptococcus pneumoniae Streptococcus pyogenes Viridans group StreptococcusGram-negative Bacteria Eikenellacorrodens Proteus mirabilis Anaerobic Bacteria Bacteroidesspecies including Bacteroides fragilis Fusobacterium species Peptostreptococcus species Susceptibility Test MethodsFor specific information regarding susceptibility test interpretive criteria and associated test methods and quality control standards recognized by FDA for this drug, please see: https://www.fda.gov/STIC . Long‑term studies in animals have not been performed to evaluate carcinogenic potential. AUGMENTIN (4:1 ratio formulation of amoxicillin:clavulanate) was non-mutagenic in the Ames bacterial mutation assay, and the yeast gene conversion assay. AUGMENTIN was weakly positive in the mouse lymphoma assay, but the trend toward increased mutation frequencies in this assay occurred at doses that were also associated with decreased cell survival. AUGMENTIN was negative in the mouse micronucleus test, and in the dominant lethal assay in mice. Potassium clavulanate alone was tested in the Ames bacterial mutation assay and in the mouse micronucleus test, and was negative in each of these assays. AUGMENTIN (2:1 ratio formulation of amoxicillin:clavulanate) at oral doses of up to 1,200 mg/kg/day was found to have no effect on fertility and reproductive performance in rats. Based on body surface area, this dose of amoxicillin is approximately 4 times the maximum recommended adult human oral dose (875 mg every 12 hours). For clavulanate, the dose multiple is approximately 9 times higher than the maximum recommended adult human oral dose (125 mg every 8 hours), also based on body surface area. Data from 2 pivotal trials in 1,191 patients treated for either lower respiratory tract infections or complicated urinary tract infections compared a regimen of 875 mg tablets of AUGMENTIN every 12 hours to 500 mg tablets of AUGMENTIN dosed every 8 hours (584 and 607 patients, respectively). Comparable efficacy was demonstrated between the every 12 hours and every 8 hours dosing regimens. There was no significant difference in the percentage of adverse events in each group. The most frequently reported adverse event was diarrhea; incidence rates were similar for the 875 mg every 12 hours and 500 mg every 8 hours dosing regimens (15% and 14%, respectively); however, there was a statistically significant difference (p < 0.05) in rates of severe diarrhea or withdrawals with diarrhea between the regimens: 1% for 875 mg every 12 hours regimen versus 2% for the 500 mg every 8 hours regimen. In one of these pivotal trials, patients with either pyelonephritis (n = 361) or a complicated urinary tract infection (i.e., patients with abnormalities of the urinary tract that predispose to relapse of bacteriuria following eradication, n = 268) were randomized (1:1) to receive either 875 mg tablets of AUGMENTIN every 12 hours (n=308) or 500 mg tablets of AUGMENTIN every 8 hours (n=321). The number of bacteriologically evaluable patients was comparable between the two dosing regimens. AUGMENTIN produced comparable bacteriological success rates in patients assessed 2 to 4 days immediately following end of therapy. The bacteriologic efficacy rates were comparable at one of the follow‑up visits (5 to 9 days post‑therapy) and at a late post‑therapy visit (in the majority of cases, this was 2 to 4 weeks post-therapy), as seen in Table 7. As noted before, though there was no significant difference in the percentage of adverse events in each group, there was a statistically significant difference in rates of severe diarrhea or withdrawals with diarrhea between the regimens. One US/Canadian clinical trial was conducted which compared 45/6.4 mg/kg/day (divided every 12 hours) of AUGMENTIN for 10 days versus 40/10 mg/kg/day (divided every 8 hours) of AUGMENTIN for 10 days in the treatment of acute otitis media. Only the suspension formulations were used in this trial. A total of 575 pediatric patients (aged 2 months to 12 years) were enrolled, with an even distribution among the 2 treatment groups and a comparable number of patients were evaluable (i.e., ³ 84%) per treatment group. Otitis media‑specific criteria were required for eligibility and a strong correlation was found at the end of therapy and follow‑up between these criteria and physician assessment of clinical response. The clinical efficacy rates at the end of therapy visit (defined as 2‑4 days after the completion of therapy) and at the follow‑up visit (defined as 22‑28 days post‑completion of therapy) were comparable for the 2 treatment groups, with the following cure rates obtained for the evaluable patients: At end of therapy, 87% (n = 265) and 82% (n = 260) for 45 mg/kg/day every 12 hours and 40 mg/kg/day every 8 hours, respectively. At follow‑up, 67% (n = 249) and 69% (n = 243) for 45 mg/kg/day every 12 hours and 40 mg/kg/day every 8 hours, respectively. Diarrhea was defined as either: (a) 3 or more watery or 4 or more loose/watery stools in 1 day; OR (b) 2 watery stools per day or 3 loose/watery stools per day for 2 consecutive days. The incidence of diarrhea was significantly lower in patients who received the every 12 hours regimen compared to patients who received the every 8 hours regimen (14% and 34%, respectively). In addition, the number of patients with either severe diarrhea or who were withdrawn with diarrhea was significantly lower in the every 12 hours treatment group (3% and 8% for the every 12 hours/10 day and every 8 hours/10 day, respectively). In the every 12 hours treatment group, 3 patients (1%) were withdrawn with an allergic reaction, while 1 patient in the every 8 hours group was withdrawn for this reason. The number of patients with a candidal infection of the diaper area was 4% and 6% for the every 12 hours and every 8 hours groups, respectively. It is not known if the finding of a statistically significant reduction in diarrhea with the oral suspensions dosed every 12 hours, versus suspensions dosed every 8 hours, can be extrapolated to the chewable tablets. The presence of mannitol in the chewable tablets may contribute to a different diarrhea profile. The every 12 hour oral suspensions (200 mg/5 mL and 400 mg/5 mL) are sweetened with aspartame. 1. Swanson-Biearman B, Dean BS, Lopez G, Krenzelok EP. The effects of penicillin and cephalosporin ingestions in children less than six years of age. Vet Hum Toxicol. 1988; 30: 66‑67. Tablets: 250 mg/125 mg Tablets: Each white oval film-coated tablet, debossed with AUGMENTIN on one side and 250/125 on the other side, contains 250mg amoxicillin as the trihydrate and 125mg clavulanic acid as the potassium salt. NDC 72508-018-30 bottles of 30NDC 72508-018-78 Unit Dose (10x10) 100 tablets 500 mg/125 mg Tablets: Each white oval film-coated tablet, debossed with AUGMENTIN on one side and 500/125 on the other side, contains 500mg amoxicillin as the trihydrate and 125mg clavulanic acid as the potassium salt. NDC 72508-006-14 bottles of 20NDC 72508-006-78 Unit Dose (10x10) 100 tablets875 mg/125 mg Tablets: Each scored white capsule‑shaped tablet, debossed with AUGMENTIN 875 on one side and scored on the other side, contains 875mg amoxicillin as the trihydrate and 125mg clavulanic acid as the potassium salt. NDC 72508-021-14 bottles of 20NDC 72508-021-78 Unit Dose (10x10) 100 tabletsPowder for Oral Suspension: 125 mg/31.25 mg per 5 mL: Banana-flavored powder for oral suspension (each 5 mL of reconstituted suspension contains 125 mg amoxicillin and 31.25 mg of clavulanic acid as the potassium salt). NDC 72508-012-01 75 mL bottleNDC 72508-012-03 100 mL bottleNDC 72508-012-05 150 mL bottle200 mg/28.5 mg per 5 mL: Orange-flavored powder for oral suspension (each 5 mL of reconstituted suspension contains 200 mg amoxicillin and 28.5 mg of clavulanic acid as the potassium salt). NDC 72508-013-50 50 mL bottleNDC 72508-013-51 75 mL bottleNDC 72508-013-52 100 mL bottle250 mg/62.5 mg per 5 mL: Orange-flavored powder for oral suspension (each 5 mL of reconstituted suspension contains 250 mg amoxicillin and 62.5 mg of clavulanic acid as the potassium salt). NDC 72508-004-07 75 mL bottleNDC 72508-004-10 100 mL bottleNDC 72508-004-15 150 mL bottle 400 mg/57 mg per 5 mL Orange-flavored powder for oral suspension (each 5 mL of reconstituted suspension contains 400 mg amoxicillin and 57.0 mg of clavulanic acid as the potassium salt). NDC 72508-008-50 50 mL bottleNDC 72508-008-51 75 mL bottleNDC 72508-008-52 100 mL bottleChewable Tablets:125 mg/31.25 mg Chewable Tablets: Each mottled yellow, round, lemon-lime-flavored tablet, debossed with BMP 189, contains 125 mg amoxicillin and 31.25 mg clavulanic acid as the potassium salt. NDC 72508-014-31 carton of 30 (5x6) tablets200 mg/28.5 mg Chewable Tablets: Each mottled pink, round, biconvex, cherry-banana-flavored tablet, debossed with AUGMENTIN 200, contains 200 mg amoxicillin and 28.5 mg clavulanic acid as the potassium salt. NDC 72508-015-14 carton of 20 tablets250 mg/62.5 mg Chewable Tablets: Each mottled yellow, round, lemon-lime-flavored tablet, debossed with BMP 190, contains 250 mg amoxicillin and 62.5 mg clavulanic acid as the potassium salt. NDC 72508-016-31 carton of 30 (5x6) tablets400 mg/57 mg Chewable Tablets: Each mottled pink, round, biconvex, cherry-banana-flavored tablet, debossed with AUGMENTIN 400, contains 400 mg amoxicillin and 57.0 mg clavulanic acid as the potassium salt. NDC 72508-017-14 carton of 20 tabletsDispense in original container.Store tablets and dry powder at or below 25°C (77°F).Store reconstituted suspension under refrigeration. Discard unused suspension after 10 days.Keep out of the reach of children.